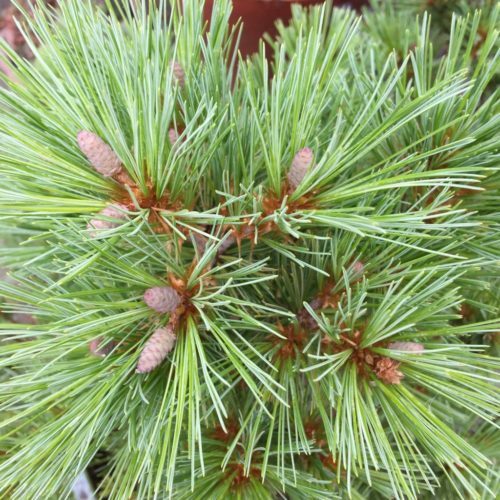 Pinus strobus 'Raraflora' is a irregular upright, dwarf selection of eastern white pine with tidy, open branching and fluffy bluish green foliage that is somewhat shorter than that typical of the species. After 10 years of growth, a mature specimen will measure 24 to 30 inches (60 - 75 cm) tall and 12 to 15 inches (30 - 40 cm) wide, an annual growth rate of 2 to 3 inches (7.5 - 10 cm). This conifer's origin is unclear. The name suggests that it was introduced by Fred and Helene Bergman of Feasterville, Pennsylvania, USA. The Bergmans introduced many fine conifers through their Raraflora nursery. Botanical literature describes a Pinus strobus 'Raraflora Nana Glauca' which is in all likelihood the same plant whose name was corrected to remove the Latin parts, suggesting that it was introduced after 1959. 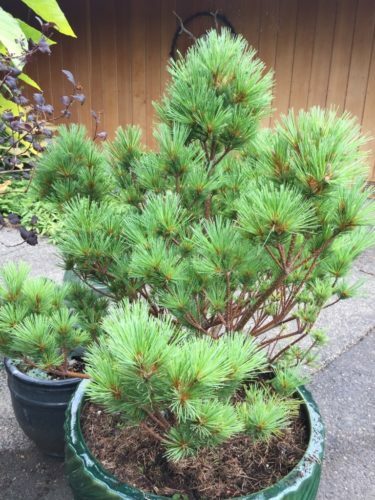 Pinus strobus 'Raraflora' — a mature specimen in a container. Pinus strobus 'Raraflora' — a closeup of foliage detail.